CET are 8 and a half years old! Headed to Canada for spring break! At Beacon Hill children's farm they have the friendliest goats. We probably spent a good 2 hours hanging out with them! Caleb with a slightly older kid, ha! Look at these hobo's bumming around! You can't tell from this picture but those rocks on the beach were so pretty, so many different colors and patterns. We kept a few as souvenirs, shhh don't tell anyone, ha! "I saw lots of oysters, muscles, and some clams." I'm guessing he probably didn't, maybe a barnacle or two, hahaha! Thomas, do you see his little otter hanging from his jacket? 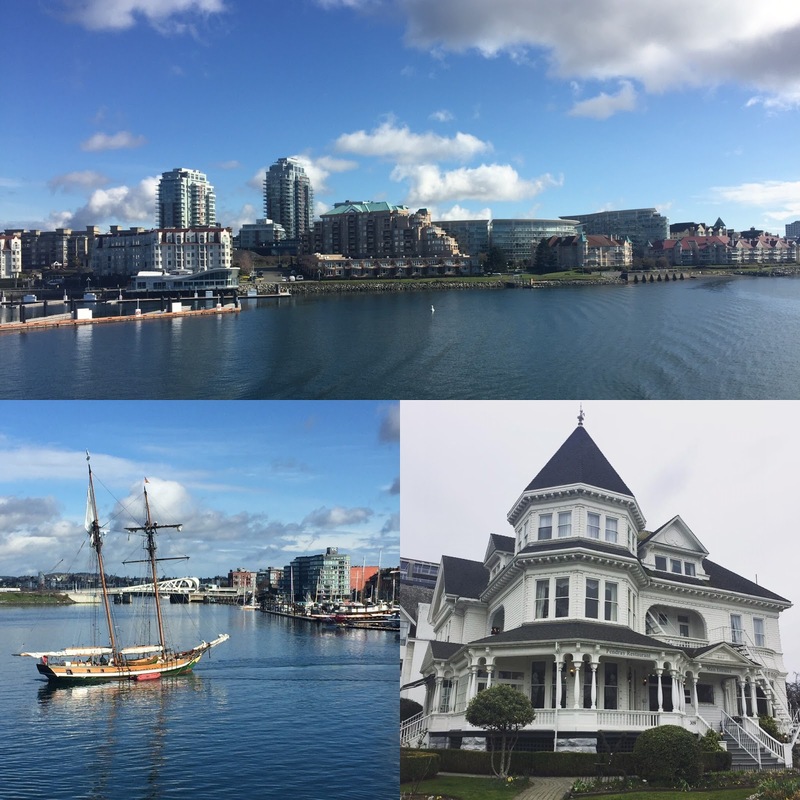 Victoria, BC you are so lovely! Folks, it's been months since we had a proper vacation! Spring break couldn't come any sooner. On Saturday we drove approximately 4 hours to Port Angeles, WA. We ditched the car there and hopped on a ferry to Vancouver Island. The boat ride, at 17 miles an hour, took a little over an hour before arriving in Victoria, BC. Phil and I have been here many times before but this was the first time for the boys. They just loved riding the ferry and they even saw some seals and otters from the boat. Downtown Victoria is super walk-able and there is lots to see just by foot. Some day it will be nice to bring the car onto the ferry and explore "up island" as they call it there. We stayed 3 nights and the night before we left Eli tells me "I really feel like I don't want to leave." Earlier Phil had said the same thing, ha! I'm afraid that's the sign of a good vacation my friends. We didn't know what to expect weather wise but Victoria is jam packed full of stuff to do both indoors and out. Thankfully the weather conditions were lovely so we mostly meandered outdoors for those 3 days and had a blast doing it. Day 1: Highlight of the day was the ferry ride! We arrived downtown around 4pm and walked to our hotel in Chinatown. After resting a bit we wandered around Chinatown until we found a place that looked good for dinner. We were not disappointed, it wasn't traditional Chinese-American (or do they call it Chinese-Canadian here?) but it was super delicious. Don't know what any of it was called, we just pointed at pictures and gawked at what others were eating and picked that way, haha! Day 2: Ate a yummy breakfast then headed to the Children's Farm at Beacon Hill Park. We got there just in time to watch the goat stampede. Who needs Pamplona's running of the bulls when you can watch 3 dozen adorable dwarf goats and their babies run out of a barn to their play area!? Seriously the cutest thing I've seen in a long time. There are lots of other animals on the farm too but the goats are the main attraction. I should mention the rest of Beacon Hill Park is beautiful and there is a great playground for kids. After spending a good part of the day here we headed off for some Fish n Chips of course. It is said that Victoria is more British than Britain, ha! After lunch we hung around the harbor and watched a street performance where both Phil and Thomas participated in. Thomas even made $5 CAD for it! Besides that, we gave the boys some Canadian money, which they were fascinated by. There was no shortage of gift shops for the boys to spend it at too. Some rest was needed then we found some Vietnamese for dinner. The best vermicelli bowls we've had in a while, or maybe we were just so hungry that it felt that way. Victoria is a great place for a family vacation and it's a bonus that the US dollar goes a little farther out there! I've gone a total of 5 times now and it has never disappointed me! Phil and I both talked about on how every meal we had there was so delicious. Most of which were found by just walking around and seeing what looked good. There is still so much for the kids to see and do there, we'll have to go again soon! CET are 101 months old! Caleb is currently obsessed with otters, ha! They are all named Wilburt, in honor of his first stuffed otter that he had but lost. At the end of every night we ask the boys who they want to pray for and Caleb, shortly after he lost the original Wilburt said, "I want to pray for Wilburt, where ever he may be." Mama Sue, papa Ed and cousin K came for a visit last week. We had a good time with them despite the somewhat bad weather. They got to see the boys in action playing on their basketball team, had a fun day exploring the science museum OMSI, and eating yummy foods including the famous cook to order Pips donuts! After dropping them off at the airport Eli said "I wish they never had to leave." The boys absolutely adore visitors and always get sad when the visit has to end. The boys have had a really good basketball season. They play on a team that is for kindergarten through 2nd grade so it's their last year playing in this league. They get a lot of action since they are among the "big" kids and they are really quite good. Last night all the boys together scored 19 shots (or 38 points) which was probably 80% of the teams points (10 players and all get equal playing time). Caleb is really good at defending and getting rebounds. Out of all the boys Caleb has made the most improvement this year but is still a ways away from being as good as the dream team (aka Eli & Thomas). Thomas is great at layups and Eli is a great shooter. All three boys are as quick as cheetahs which gives them a competitive edge over the other kids their age even though they are a good 2-3 inches shorter. They get so many breakaways that they get lots of open shots while their opponents are running up behind them. They have one more game and I'm working on compiling a highlights movie to post here so hopefully you can see them in action. We'd been having such a warm winter up until February showed up then it got COLD! After so many threats of snow and no shows we are ready for spring like weather. This last stretch of winter is always the hardest to get through. I'm getting antsy as we have some really fun and awesome things planned for next summer, can't wait! Here is a little buzzer beater by Eli last night! As I write this post I can't help but sing "Its a small world after all" from the infamous Disney ride. Turns out, our family heritage covers 4 out of the 7 continents! I've been very curious about those DNA testing companies that calculate your heritage ever since they've become commercially available. My hunch at the beginning though, like with all new technology, was that I will wait. I will wait because it will get better. This seems to be Phil and I's modo, for example we waited until the iPhone 3 to get a smart phone and a flat screen T.V. until years later when you could get a pretty big one for under $350. Mostly we're just cheap, ha! I finally decided it was time, all the companies were offering great black Friday sales and I did my research. I decided to go with AncestryDNA because they have the biggest sample size to compare to and they concentrate more on ancestry analysis instead of health analysis (were they tell you things like, you should have an aversion to cilantro based on your results). It was such a great deal I bought 4 kits! One for me, one for Phil, one for the boys to share since they have identical DNA and one for my mom because she was visiting at the time and thought 'heck why not!' Funny enough Phil gave me the same story I've heard from so many otherwise Caucasian looking folks "I'm part native american." "Its folklore, everyone thinks they are part Native American" I told him. "No really I am" is the response everyone gives, ha! As I rub my hands together I tell myself "well its time to find out!" Phil's always thought they were German and French but never really certain just 'I think that's what we are.' Well results show probably neither but maybe. And not a trace of Native American, of course. As caucasian as caucasian can be. Whats most interesting to me is that Phil looks like he should be a red head but with out the red hair and come to find out he's a great deal of Irish/Scottish! Both my parents are from Mexico but as you all may or may not know people from Mexico can vary a lot, from blue eyes/blonde hair to those who are truly indigenous to the Americas with black hair/brown eyes. So looking somewhere in the middle I figured I was some part Spanish and some part Native. I was certainly surprised by all the rest! I've been watching lots of food documentaries about the culinary history of Mexico and have learned that all sorts of people immigrated to Mexico. I've come to appreciate how delicious, diverse and unique the food from Mexico really is! I really was spoiled growing up eating that stuff, ha! Anyways knowing what I know now about the food history the results don't surprise me too much. Wait a minute 54% dad and only 46% mom. Hey that's not fair! Well lets just chalk it up to the fact that it's not a perfect science, ha! For the boys' sample I had them all spit into the same collection tube, I wish I had recorded it because it was so funny how grossed out they were by it. They would wipe off the top before they spit and then would run away yelling after spitting. They share water bottles, lollipops, toothbrushes, shoes, sleep in the same bed but they are grossed out by each others spit, hahaha! CET are 8yrs and 3mo! Winter break has been a blast! The first week mama Elda rolled into town and she had fun all week long with the boys. She made lots of delicious foods as usual and I'm pretty sure the boys gained more than the ordinary amount of weight, ha! Next time I need to weigh the boys before and after my mom comes to visit to prove it, haha! The rest of winter break I took off from work. It was nice that the boys didn't have to go to a single day of day camp (and even better we didn't have to pay for it!). The boys and I had fun going to see movies, baking and decorating cookies, and playing board games. We stayed warm and cozy indoors and it was very relaxing. Phil had some extra days off so we took advantage and went sledding for the first time since they were 4 years old. If you remember the last time Thomas got a concussion from a bad sledding fall so we were all a little traumatized and hadn't wanted to go back. No injuries this time just lots of fun was had. Now I'm not ready to go back to work nor are the boys ready to go back to school but I guess we must! At Bollywood Theater with mama Elda, its a super yummy Indian restaurant. Having fun with out me!